My first carrier was a gift from my sister made by Infantino. It’s like the BabyBjörn carrier but about the third of the price. I couldn’t justify spending that much ($80) for a carrier that I probably wouldn’t use very often, and didn’t know if Emma would even like it. The pluses of this carrier is that baby can be worn facing out so they can see and explore the world unlike some of the others. 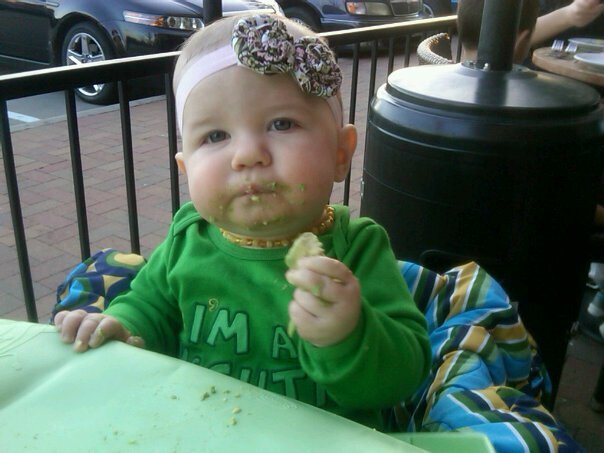 The downfall is that the original only lasts until they are 25 pounds, so it’s great for a newborn up until about a year or so depending on your baby’s size. UPDATE: These carriers are apparently not good for baby’s hips (could cause hip dysplasia), so if you do have one, make sure to only keep them in it for no more than 30 minutes. The next purchase that I couldn’t wait to get was the Moby Wrap. It long piece of fabric that looks complicated, but is pretty easy once you get the hang of it, and actually comfortable. According to their website, babywearing promotes strong attachment, reduces crying significantly, lowers incidence of illness, provides a sense of calmness, and so much more. I guess I never thought of these benefits while choosing to become a babywearer, I just liked the idea of being close to my child and possibly having the option to nurse while we walked. Um yeah, I don’t think we ever got that one figured out especially because we had so many issues early on. But, I did get on board with the Moby because it showed you could do exercises like squats and pliés while carrying baby around. That sounded like a win-win to me! The next carrier I purchased was a Thing-A-Ma-Sling. I was trying to find a good sling out there and read reviews on the Balboa slings which were mostly bad. I liked the hand-made design of it and of course the color, since I’m OBSESSED with all things lime green, so it felt like a good purchase. It seemed like a sling was foolproof when wanting to nurse but again I thought, too easy drill sergeant, right? Wrong. By the time I got the sling, Emma was a good hefty 18 pounds and not the easiest to carry out and about. I will say when it came to nursing in public, there was one time that I did it outright as we were walking through the mall. We had good friends come up around Christmastime and were all headed to see the train display and didn’t have much time to spare. I knew Emma was HUNGRY so I said I’ll nurse her as we walk through the mall. It didn’t seem too bad since I had my coat on and my scarf to cover any possibility of exposure to the general public. It did seem like everyone was looking at me knowing what I was doing; but that could have been because there was a mass of people out holiday shopping. Either way I didn’t care because baby girl was satisfied and so was I. There you have it, nursing in public can and should be done! 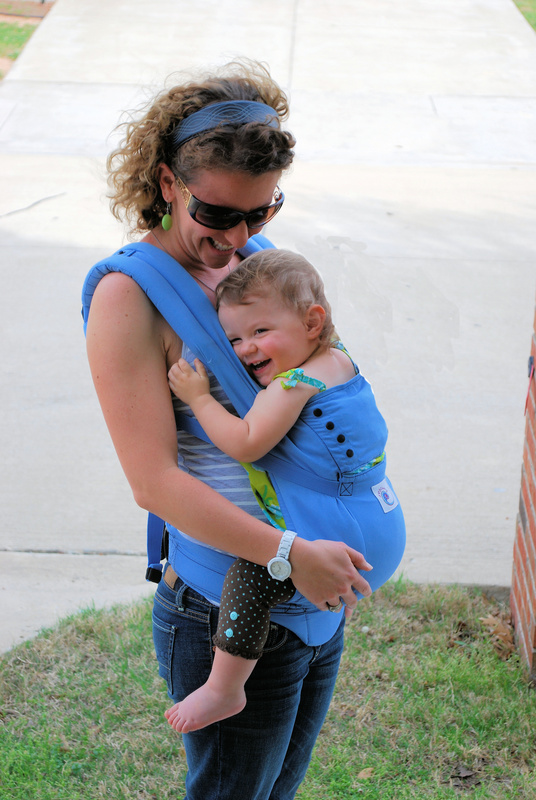 The cream of the crop (at least to me) is the Ergobaby carrier. You can use this puppy from birth, with an infant insert, until they are 45 pounds. I hadn’t heard about them until my crunchy friend mentioned it while I was pregnant, and I never thought about it ’til much later. 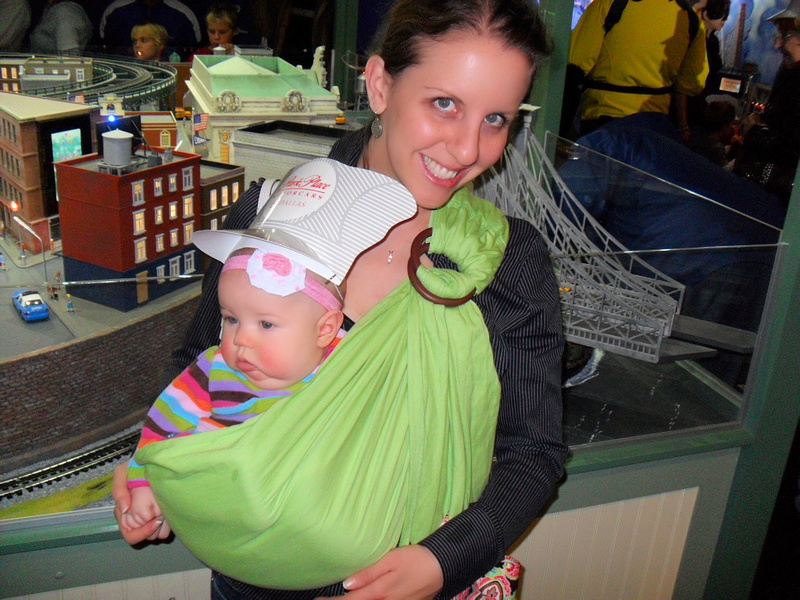 This friend used her Ergo to carry her 4-year-old, 40 pound daughter WHILE pregnant with her son. This is serious business with babywearing! You can wear it on the front, back, or side. The downfall to this carrier is that baby can only face you while being carried on your front. I remember going through security while wearing Emma, and one of the TSA guys came up to me and said, ‘I think she wants to face out.’ I said yes I know that, but it’s not possible. It probably didn’t help that she was doing backbends to try to see out while we were trying to get through the crowds. Another drawback with this carrier is the price-around $140, though I got my for half price from BabySteals as my Mother’s Day gift. I guess you can look at it like an investment especially since it lasts for quite some time. If I totaled all mine together it would come out to $155 (not counting the Ergo) and that’s cheaper than the Ergo and can be used longer. You can still nurse with this carrier along with exercise in it, so not to fret. I absolutely love taking walks with Emma in it, because I feel closer to her and am able to point out the world as we pass. I have lately started grocery shopping with her and she seems content as long as she has Teddy to soothe her. All in all I LOVE this carrier and seem to notice a lot of mamas walking around town with them. I guess there is some underground babywearing club that I was not privy to until late in the game. Better late than never. And just so you know, dads can (& should) babywear, too! 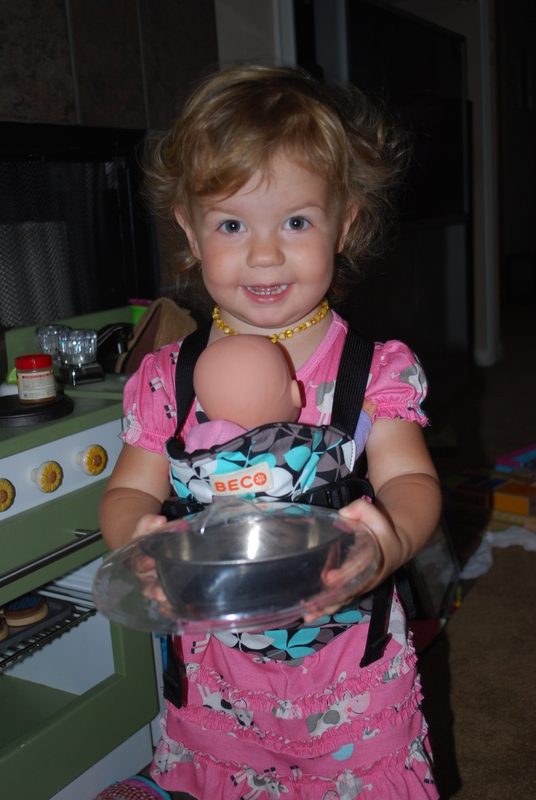 Well there you have it, a review on 4 different type of carriers and some facts on babywearing. I say look into it if you’re curious as it’s a great way for both moms AND dads to be close to their babies. I am also a big proponent of Kangaroo Care, which is where you strip baby down to a diaper and mama down to a nursing bra, to prevent leakage, and lay together either for a nap or just for warmth. I loved doing this when Emma was first-born and continued for her first few months (it can even increase your milk supply). I even made Josh do this and to me it seemed so special for the two of them to bond and feel each other’s warmth. For proof that Kangaroo Care can work wonders, check out this article. Amazing indeed! 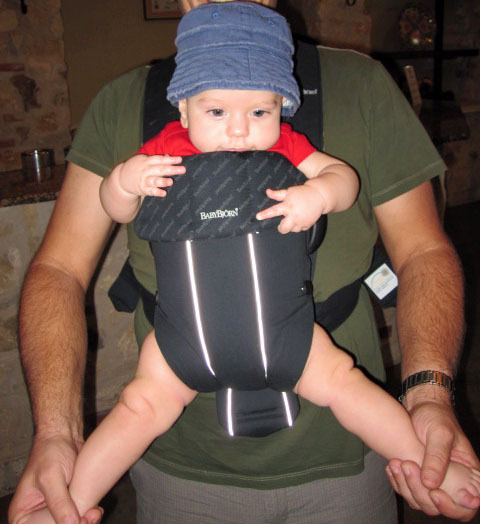 Alright…sling it on me, how do you wear your baby (if you do): inside, outside, upside-down? 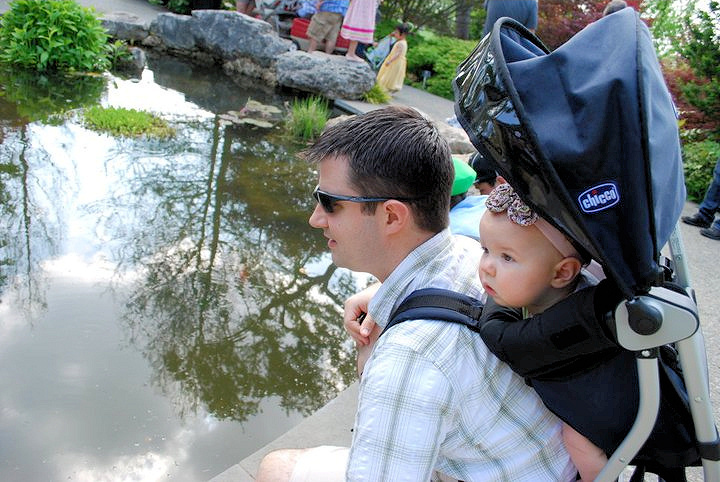 Yeah, this summer is going to be nasty with babywearing for baby and mama! I haven’t heard of the maya-how do you like it? Is it like a moby?